Definition at line 68 of file llviewerjointmesh.h. Definition at line 144 of file llviewerjointmesh.cpp. References FALSE, mColor, mCullBackFaces, mFace, mMesh, mMeshID, mNumSkinJoints, mShiny, mSkinJoints, LLJoint::mUpdateXform, LLViewerJoint::mValid, NULL, and TRUE. Definition at line 177 of file llviewerjointmesh.cpp. References freeSkinData(), mMesh, mTexture, and NULL. Definition at line 188 of file llviewerjointmesh.cpp. References mNumSkinJoints, mSkinJoints, and TRUE. Definition at line 516 of file llviewerjointmesh.cpp. Definition at line 562 of file llviewerjointmesh.cpp. References LLViewerImage::bind(), LLImageGL::bindExternalTexture(), LLTexLayerSetBuffer::bindTexture(), count, end, f, LLTexLayerSet::getComposite(), LLViewerImageList::getImage(), LLPolyMesh::getNumFaces(), LLFace::getPool(), LLDrawPool::getVertexShaderLevel(), LLJoint::getWorldMatrix(), gImageList, glColor4f, glColor4fv, glMultMatrixf, glPopMatrix, gMaterialIndex, gRenderForSelect, gSpecularIndex, LLTexLayerSet::hasComposite(), LLPolyMesh::hasWeights(), IMG_DEFAULT, IMG_DEFAULT_AVATAR, LLPointer< Type >::isNull(), isTransparent(), llassert, llDrawRangeElements(), llendl, llwarns, mColor, mFace, LLPolyMesh::mFaceIndexCount, LLPolyMesh::mFaceIndexOffset, LLPolyMesh::mFaceVertexCount, LLPolyMesh::mFaceVertexOffset, mIsTransparent, mLayerSet, LLMatrix4::mMatrix, mMesh, mShiny, mTestImageName, mTexture, LLColor4::mV, LLViewerJoint::mValid, LLFace::mVertexBuffer, LLViewerJoint::mVisible, LLPointer< Type >::notNull(), sRenderMask, start, stop_glerror, and uploadJointMatrices(). Definition at line 1161 of file llviewerjointmesh.cpp. References llendl, llinfos, LLJoint::mName, and LLViewerJoint::mValid. Definition at line 240 of file llviewerjointmesh.cpp. References mNumSkinJoints, mSkinJoints, and NULL. Referenced by setMesh(), and ~LLViewerJointMesh(). Definition at line 198 of file llviewerjointmesh.cpp. References LLDynamicArray< Type, BlockSize >::count(), LLPolyMesh::getReferenceMesh(), LLPolyMesh::mJointRenderData, mMesh, mNumSkinJoints, and S32. Definition at line 250 of file llviewerjointmesh.cpp. Definition at line 314 of file llviewerjointmesh.cpp. Referenced by LLVOAvatar::getHeadMesh(), LLVOAvatar::getUpperBodyMesh(), and LLVOAvatar::loadMeshNodes(). Definition at line 135 of file llviewerjointmesh.h. Definition at line 150 of file llviewerjointmesh.h. Definition at line 523 of file llviewerjointmesh.cpp. Definition at line 261 of file llviewerjointmesh.cpp. Referenced by LLVOAvatar::loadMeshNodes(), LLVOAvatar::onGlobalColorChanged(), and LLVOAvatar::updateMeshTextures(). Definition at line 148 of file llviewerjointmesh.h. Definition at line 298 of file llviewerjointmesh.cpp. References mLayerSet, mTexture, and NULL. Definition at line 322 of file llviewerjointmesh.cpp. References allocateSkinData(), LLJoint::findJoint(), freeSkinData(), LLPolyMesh::getJointNames(), LLPolyMesh::getNumJointNames(), LLPolyMesh::getPosition(), LLJoint::getRoot(), LLPolyMesh::getRotation(), LLPolyMesh::getScale(), LLPolyMesh::hasWeights(), LLPolyMesh::isLOD(), mMesh, mSkinJoints, NULL, LLJoint::setPosition(), LLJoint::setRotation(), LLJoint::setScale(), setupJoint(), and LLSkinJoint::setupSkinJoint(). Referenced by LLVOAvatar::buildCharacter(), and LLVOAvatar::loadMeshNodes(). Definition at line 132 of file llviewerjointmesh.h. Definition at line 109 of file llviewerjointmesh.h. Definition at line 114 of file llviewerjointmesh.h. Definition at line 281 of file llviewerjointmesh.cpp. References mLayerSet, mTexture, NULL, and texture. Referenced by LLVOAvatar::updateMeshTextures(), and LLVOAvatar::useBakedTexture(). Definition at line 369 of file llviewerjointmesh.cpp. References LLDynamicArray< Type, BlockSize >::count(), LLJoint::getParent(), LLJoint::getWorldMatrix(), LLSkinJoint::mJoint, LLPolyMesh::mJointRenderData, mMesh, mNumSkinJoints, mSkinJoints, NULL, and LLDynamicArray< Type, BlockSize >::put(). Definition at line 847 of file llviewerjointmesh.cpp. References face, LLPolyMesh::getBinormals(), LLPolyMesh::getClothingWeights(), LLPolyMesh::getCoords(), LLPolyMesh::getFaces(), LLPolyMesh::getNormals(), LLPolyMesh::getNumFaces(), LLPolyMesh::getNumVertices(), LLPolyMesh::getTexCoords(), LLPolyMesh::getWeights(), i, j, mFace, LLPolyMesh::mFaceIndexOffset, LLPolyMesh::mFaceVertexOffset, mMesh, LLViewerJoint::mValid, and S32. Definition at line 827 of file llviewerjointmesh.cpp. References LLPolyMesh::getNumVertices(), LLPolyMesh::getReferenceMesh(), LLPolyMesh::getSharedData(), LLPolyMesh::mCurVertexCount, LLPolyMesh::mFaceIndexCount, LLPolyMesh::mFaceIndexOffset, LLPolyMesh::mFaceVertexCount, LLPolyMesh::mFaceVertexOffset, mMesh, LLPolyMeshSharedData::mNumTriangleIndices, and LLViewerJoint::mValid. Definition at line 1020 of file llviewerjointmesh.cpp. References a, b, FALSE, LLTimer::getElapsedSeconds(), LLTimer::getElapsedTimeF64(), LLShaderMgr::getVertexShaderLevel(), gSavedSettings, gVectorizePerfTest, gVectorizeProcessor, LLPolyMesh::hasWeights(), i, llendl, llinfos, mFace, mMesh, LLViewerJoint::mValid, LLFace::mVertexBuffer, LLPointer< Type >::notNull(), LLControlGroup::setBOOL(), LLShaderMgr::SHADER_AVATAR, sUpdateGeometryFunc, TRUE, updateGeometryOriginal(), and uploadJointMatrices(). Definition at line 914 of file llviewerjointmesh.cpp. References f, F32_MAX, LLPolyMesh::getCoords(), LLPolyMesh::getNormals(), LLVertexBuffer::getNormalStrider(), LLPolyMesh::getNumVertices(), LLVertexBuffer::getVertexStrider(), LLPolyMesh::getWeights(), gJointMatUnaligned, gJointRotUnaligned, lerp(), llfloor(), mFace, LLPolyMesh::mFaceVertexOffset, LLMatrix3::mMatrix, LLMatrix4::mMatrix, mMesh, LLFace::mVertexBuffer, S32, VW, VX, VY, and VZ. Referenced by update_vector_performances(), and updateGeometry(). Definition at line 112 of file llviewerjointmesh_sse.cpp. Definition at line 119 of file llviewerjointmesh_sse2.cpp. Definition at line 52 of file llviewerjointmesh_vec.cpp. References LLDynamicArray< Type, BlockSize >::count(), F32_MAX, face, LLPolyMesh::getCoords(), LLPolyMesh::getNormals(), LLVertexBuffer::getNormalStrider(), LLPolyMesh::getNumVertices(), LLPolyMesh::getReferenceMesh(), LLVertexBuffer::getVertexStrider(), LLPolyMesh::getWeights(), j, LLV4Matrix4::lerp(), llfloor(), LLPolyMesh::mFaceVertexOffset, LLPolyMesh::mJointRenderData, LLV4Matrix4::multiply(), NULL, S32, and LLV4Matrix4::translate(). Referenced by update_vector_performances(), updateGeometrySSE(), and updateGeometrySSE2(). Definition at line 906 of file llviewerjointmesh.cpp. References LLViewerJoint::mValid, LLViewerJoint::setValid(), and TRUE. Definition at line 431 of file llviewerjointmesh.cpp. References LLDynamicArray< Type, BlockSize >::count(), FALSE, gAvatarMatrixParam, LLDrawPoolAvatar::getModelView(), LLFace::getPool(), LLPolyMesh::getReferenceMesh(), LLDrawPool::getVertexShaderLevel(), gJointMatUnaligned, gJointPivot, gJointRotUnaligned, i, j, LL_CHARACTER_MAX_JOINTS_PER_MESH, mFace, LLPolyMesh::mJointRenderData, mMesh, LLVector4::mV, NULL, S32, LLMatrix4::translate(), TRUE, and VW. Referenced by drawShape(), and updateGeometry(). Definition at line 1169 of file llviewerjointmesh.cpp. References coord, f, getBoundJointsByIndex(), LLCharacter::getCharacterJoint(), LLPolyMesh::getCoords(), LLPolyMesh::getFaces(), LLPolyMesh::getNormals(), LLPolyMesh::getNumFaces(), LLPolyMesh::getNumVertices(), LLJoint::getParent(), LLJoint::getScale(), LLJoint::getSkinOffset(), LLPolyMesh::getTexCoords(), LLPolyMesh::getWeights(), LLPolyMesh::hasWeights(), i, lerp(), llfloor(), LLJoint::mJointNum, mMesh, S32, LLVector3::scaleVec(), VX, VY, and VZ. Definition at line 71 of file llviewerjointmesh.h. Referenced by drawShape(), getColor(), LLViewerJointMesh(), and setColor(). Definition at line 78 of file llviewerjointmesh.h. Definition at line 79 of file llviewerjointmesh.h. Referenced by drawShape(), LLViewerJointMesh(), updateFaceData(), updateGeometry(), updateGeometryOriginal(), and uploadJointMatrices(). Definition at line 81 of file llviewerjointmesh.h. Definition at line 82 of file llviewerjointmesh.h. Referenced by drawShape(), isTransparent(), and setIsTransparent(). Definition at line 75 of file llviewerjointmesh.h. Referenced by drawShape(), setLayerSet(), and setTexture(). Definition at line 77 of file llviewerjointmesh.h. 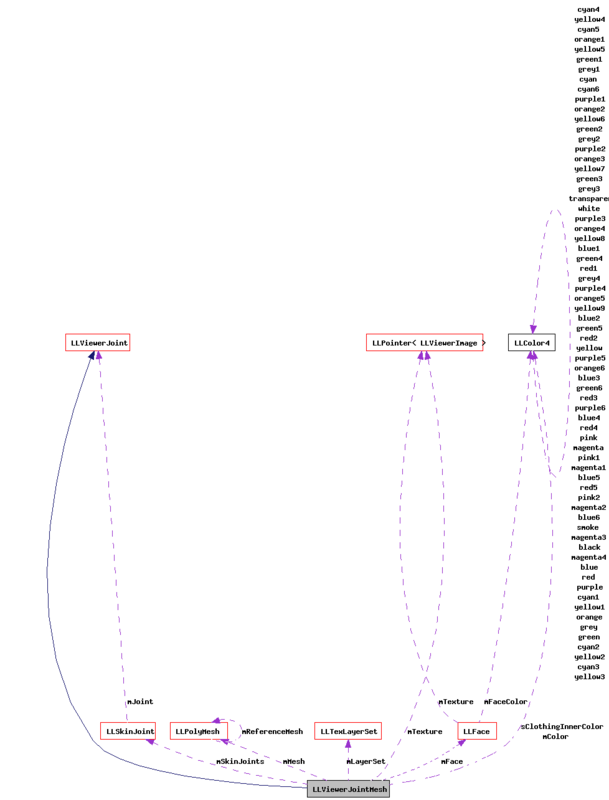 Referenced by drawShape(), getBoundJointsByIndex(), getMesh(), LLViewerJointMesh(), setMesh(), setupJoint(), updateFaceData(), updateFaceSizes(), updateGeometry(), updateGeometryOriginal(), uploadJointMatrices(), writeCAL3D(), and ~LLViewerJointMesh(). Definition at line 86 of file llviewerjointmesh.h. Referenced by getMeshID(), LLViewerJointMesh(), and setMeshID(). Definition at line 84 of file llviewerjointmesh.h. Referenced by allocateSkinData(), freeSkinData(), getBoundJointsByIndex(), LLViewerJointMesh(), and setupJoint(). Definition at line 73 of file llviewerjointmesh.h. Referenced by drawShape(), LLViewerJointMesh(), and setSpecular(). Definition at line 85 of file llviewerjointmesh.h. Referenced by allocateSkinData(), freeSkinData(), LLViewerJointMesh(), setMesh(), and setupJoint(). Definition at line 76 of file llviewerjointmesh.h. Referenced by drawShape(), and setTestTexture(). Definition at line 74 of file llviewerjointmesh.h. Referenced by drawShape(), setLayerSet(), setTexture(), and ~LLViewerJointMesh(). Definition at line 93 of file llviewerjointmesh.h. Definition at line 91 of file llviewerjointmesh.h. Definition at line 89 of file llviewerjointmesh.h. Definition at line 92 of file llviewerjointmesh.h. Definition at line 1018 of file llviewerjointmesh.cpp.